The all-powerful Texas GOP has resorted to apologetics to explain the emergence of Democrat State Sen. Wendy Davis, who filed her candidacy for governor on November 9. 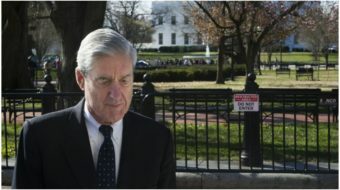 When questioning how an omnipotent power could allow for the existence of a viable challenger, Republicans pointed the finger at the only logical culprit: one of their own. Specifically, members of the GOP turned on Lieutenant Governor David Dewhurst, whom they blamed for setting the scene for Davis’ rise. 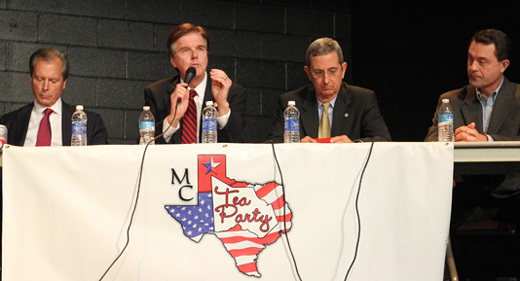 In a statement redolent of nervousness over Davis’ popularity, State Sen. Dan Patrick blasted the lieutenant governor for allowing the filibuster that “made Davis a national star and put a bull’s-eye on Texas.” Patrick did not elaborate on whether he believed Davis drew the “bull’s-eye” herself, or if his party’s regressive tea party politics may have had something to do with it. Patrick, whose comments came during a November 12 debate between hopefuls for the GOP’s nomination for lieutenant governor, went on to bemoan how much it will cost to buy the election out from under Davis. “This race that’s going to cost Republicans $30 to $40 million should have never happened,” said Patrick. Another debater, State Agriculture Commissioner Todd Staples, condemned Dewhurst’s “failed leadership” in allowing the filibuster, which is a legal legislative safeguard meant to preserve the rights of minority party constituents. The specter of Wendy Davis haunted the entirety of the debate. At one point, Dewhurst defended himself through the rationale that a Davis campaign was doomed anyway, so in the end the filibuster did not matter. “Look at the scoreboard,” he said in reference to the abortion bill’s eventual passage. “It’s Wendy Davis 0, life 1.” Having established the solipsism that the battle against Davis is one of life versus death, Dewhurst went on to predict that Davis would eventually have to settle for an appointment in the Obama administration. The debate, held at a North Dallas church, pitted the four tea party candidates in the GOP primary for lieutenant governor against one another. In addition to Patrick, Dewhurst and Staples, Jerry Patterson, the current Texas Land Commissioner, participated in the event.